Just because a technology is “cool” or “immersive” does not mean that it is well suited for the classroom. To truly have an impact on learning, classroom technology should go beyond simple engagement (i.e. “wow, this is fun!”). It must build skills or teach concepts. 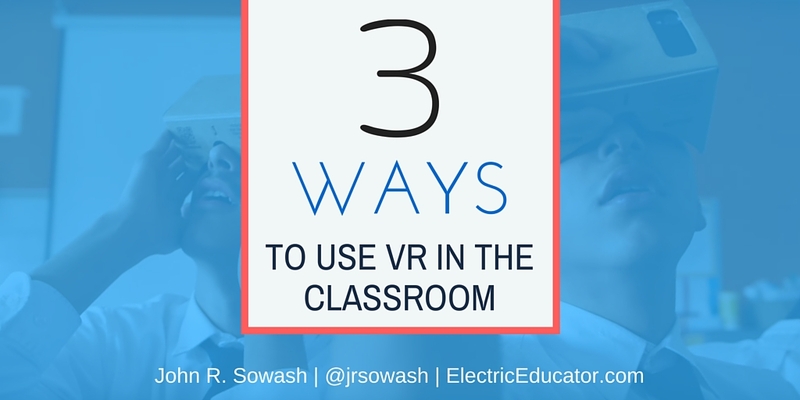 There are three levels at which VR can be incorporated into the classroom. None of the levels are inherently better. Each one has a purpose. An effective lesson will likely include all three levels of engagement. Note: these levels are similar to the SAMR model of technology integration. Students observe content and media in a passive setting. This is the simplest way to use VR in the classroom. Virtual reality is being use as a “hook” to engage students. Using VR for observation is usually a short experience followed by other forms of classwork or instruction. Exploration with VR extends simple observations by asking students to go deeper and to record observations or reflections. Explore with VR encompasses virtual field trips which may be facilitated by the teacher. Students should be expected to record their thoughts, feelings, and experience during or after their experience. Students begin by observing, start explore, and conclude by creating original content. Created content might include original writing, video, stories, images, or new VR content. Do you agree with this framework? Think I left something out? Leave me a comment and let me know! I like these ideas and the fact that you took into account the samr model. It's interesting to find more possibilities to explore. Just got a classroom set of Google Cardboard and the kids love them. Excellent article that has led me to some excellent resources!